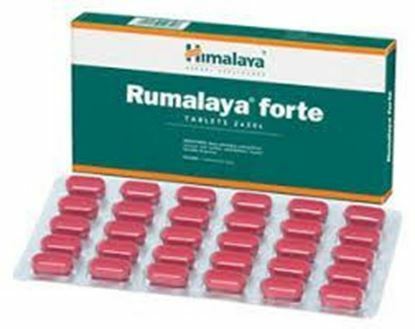 Properties FormTablet Weight73 (gms) Dimensions15.5 (cm) x 7.2 (cm) x 2 (cm) About Rumalaya Forte Tablet Rumalaya forte from Himalaya Herbals is a powerful herbal ayurvedic formulation with the dual advantage of Boswellia and Guggul. Rumalaya forte helps to maintain the integrity of joints and muscles and connective tissue. It promotes normal strength and flexibility of the joints and muscles. Maintaining joint health is important since joints allow our bodies to move and be flexible in order to perform everyday tasks. Cartilage helps to cushion the joints which also have fluid that helps reduce friction. Rumalaya Forte provides overall support of the musculoskeletal system Boswellia and Guggulu present in Rumalaya forte are well known in worldwide medical and scientific communities for their proven efficacy in joint care. Guduchi in Rumalaya forte is well known for its immunomodulatory activity. Rumalaya forte also contains Alpinia galanga, Licorice and Tribulus terrestris - herbs that maintain flexibility and support connective tissue. Rumalaya forte Ingredients Boswellia / Shallaki (Boswellia serrata) Indian Bedellium / Guggul (Commiphora wightii) Rasna (Alpinia galanga) Licorice / Yashti madhu (Glycyrrhiza glabra) Small caltrops / Gokshura (Tribulus terrestris) Tinospora Gulancha / Guduchi (Tinospora cordifolia) Benefits of Rumalaya forte Rumalaya Forte maintains healthy, mobile joints and muscles Rumalaya Forte relieves everyday pain and stiffness Rumalaya Fore supports a normal inflammatory response Rumalaya Forte helps cope with sprains and strains from physical activity Rumalaya Forte maintains healthy cartilage and connective tissue Rumalaya Forte promotes circulation Rumalaya Forte keeps all joints moving freely Rumalaya Forte supports health in large joints as well as small joints of the hands, feet, toes, elbows and knees Rumalaya Forte supports muscle energy and joint vitality. Rumalaya Forte promotes a healthy range of motion and normal body flexibility Rumalaya Forte maintains comfort levels in all joints Directions for taking Rumalaya forte 2 capsules twice daily with meals. Use with RUMALAYA GEL for best results. Terms and Conditions We have assumed that you have consulted a physician before purchasing this medicine and are not self medicating. Properties FormCapsule Weight37 (gms) Dimensions4.3 (cm) x 4.3 (cm) x 6.4 (cm) About Talekt Capsule Skin disorders: Talekt’s antimicrobial and detoxifying properties combat dermal infections caused by gram-positive and gram-negative bacteria. The anti-allergic property of Talekt controls itching associated with dermal infections and allergies. 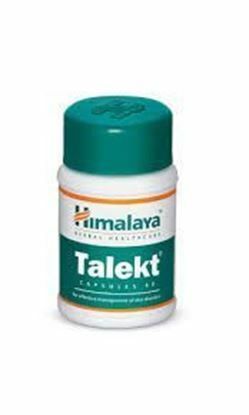 Enhances the immune system: Talekt enhances the immune response to dermal infections and, as a result, reduces the risk of relapse. Key ingredients of Talekt Capsule Turmeric (Haridra): has strong anti-inflammatory and anti-allergic properties, which soothe the skin. It significantly inhibits OVA-induced allergies that extend anti-allergic reactions. Turmeric is also a potent antimicrobial agent that combats common bacteria. The herb also speeds up the wound healing process. Neem (Nimba): is especially beneficial for bacterial skin disorders. Acne-causing bacteria are instantly killed by Neem leaves. It is a detoxifier that eliminates impurities from the skin’s surface and an anti-inflammatory, which is useful in combating various dermatological disorders. Indications of Talekt Capsule Sebaceous gland disorders: Infective and noninfective acne vulgaris Rosacea (facial redness, inflammation of the cheek, nose, chin and forehead) Bacterial skin infections: Furuncles and carbuncles (infections of the hair follicle) Paronychia (bacterial hand/foot nail infection) Dermatitis: Infective Allergic Systemic mycoses: Ringworm Candidiasis (fungal yeast infection) Parasitic skin infections: Scabies Pediculosis (lice infestation) Papulosquamous disorders: Psoriasis Talekt Capsule - Side-effects The following is a list of possible side-effects that may occur from all constituting ingredients of Talekt Capsule. This is not a comprehensive list. These side-effects are possible, but do not always occur. Some of the side-effects may be rare but serious. Consult your doctor if you observe any of the following side-effects, especially if they do not go away. Gastric Irritation Nausea Stomach Upset Terms and Conditions We have assumed that you have consulted a physician before purchasing this medicine and are not self medicating. Properties FormTablet Weight58 (gms) Dimensions4.3 (cm) x 4.3 (cm) x 6.3 (cm) Functions: Widely acclaimed as a potent mental tonic (nootropic), Brahmi literally means 'that which improves intelligence'. Improves certain brain chemicals that are involved in thinking, learning and memory, thus enhancing cognitive abilities. Calms the mind, promotes clarity of thought and helps memory consolidation. Offers potent antioxidant neuro protection via modulating key enzymes involved in the generation and scavenging of reactive oxygen species in the brain. This helps in reducing unnatural age-related brain degeneration. Ideal For: A need to improve mental agility, memory and learning in young adults and working professionals. To prevent age-associated memory problems in the elderly. Good To Know: 100% vegetarian. Free from sugar, artificial colours, artificial flavours, preservatives, and gelatin. 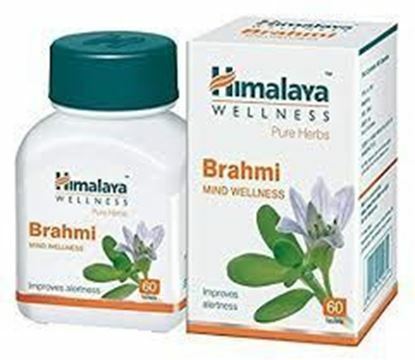 Composition: Each tablet contains: Brahmi (Bacopa monnieri) whole plant extract - 250 mg. Dosage/Directions for use: Tablet: 1-2 tablets twice daily. Special instructions: Please inform your physician before consuming in the following situations: Pregnancy Breastfeeding Diabetes Hypertension Contraindications: Specific contraindications have not been identified. Terms and Conditions We have assumed that you have consulted a physician before purchasing this medicine and are not self medicating. Properties FormOintment Weight30 (gms) Dimensions12.5 (cm) x 2.5 (cm) x 3 (cm) About Muscle and Joint Rub Muscle and Joint Rub is highly effective for backaches, muscular sprains and joint pain. Enriched with Sweet Flag, Castor Oil, Red Pepper and Spearmint, it alleviates swelling, sprains and muscle and joint inflammation. Key ingredients of Muscle and Joint Rub Red Pepper contains pain relieving and anti-inflammatory agents, which soothe sprains. Five-Leaved Chaste Tree leaves reduce joint swelling in arthritis, and its extract is an excellent pain reliever. The counter-irritant properties of Spearmint are useful in treating muscle and joint inflammation. Tasmanian Blue Gum Tree Oil and Sesame Oil are known to be potent pain relievers. They also help reduce joint swelling. Holy Basil possesses anti-inflammatory properties which significantly reduce inflammation and alleviate joint swelling. Sweet Flag improves blood circulation and alleviates swelling. It relieves pain and inflammation. The counter-irritant properties of Castor Oil alleviate joint pain associated with rheumatism and osteoarthritis. Black Pepper relieves pain and reduces nerve inflammation. Musk Root Oil extract is an effective sedative for the nerves. 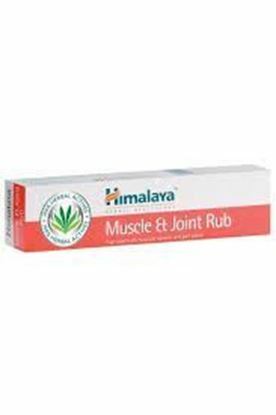 Indications of Muscle and Joint Rub Muscle & Joint Rub is useful in relieving: Sprains Minor contrusions Painful and inflammatory conditions of muscles and joints Directions for use of Muscle and Joint Rub Massage gently over the affected area. Simultaneous hot water fomentation provides optimal results. Warning Keep out of reach of children. For external use only. Terms and Conditions We have assumed that you have consulted a physician before purchasing this medicine and are not self medicating. Properties FormCapsule Weight12 (gms) Dimensions8.4 (cm) x 1.2 (cm) x 7 (cm) About Party Smart Capsules Partysmart is a stimulant-free herbal formulation that counters the side effects of alcohol intake. Taken before or during the consumption of alcohol Partysmart protects the liver by rapid elemination of aldehydes, the toxic by-products of alcohol intake. Aldehydes or Acetaldehyde is a metabolite of ethanol and causes a hangover with symptoms like headache, nausea and fatigue after drinking alcohol. Partysmart contains Andrographis paniculata (Yavatika) used in Ayurveda since thousands of years for the treatment of jaundice and other liver complaints. It has hepatoprotective and antioxidant capacities of Andrographis paniculata enhance the the liver detoxification process and help to protect the liver against damage through alcohol induced liver toxicity. It stimulates the immune system and it has purifying benefits for liver and blood. Clinical trials have shown it is even effective in the treatment of alcohol addiction. Kharbuja has potent antioxidative properties. It protects the liver against damage of free radicals and helps to relief the effects of alcohol consum. Draksha (Vitis vinifera Grape extris) are well know for its high content of vitamins. It has detoxification and antioxidant properties. Kasni is a powerful liver rejuvenator. It possess potent antioxidant properties, increases bile secretion and protects the gastric tissue against damage of excessive alcohol consum. Bhumyamalaki increases the appetite, is digestant, laxative and a liver stimulant. It is beneficial in jaundice and enlargement of liver and spleen. Amalaki (Amla) is a great rejuvenator of the liver. High in vitamin c it is a strong antioxidant and avoids damage through free radicals. Key ingredients of Party Smart Capsules Kharjura (Phoenix dactylifera) Kasani (Cichorium intybus) Yavatikta (Andrographis paniculata) Draksha (Vitis vinifera) Bhumyaamalaki (Phyllanthus amarus) Amalaki (Emblica officinalis) Indications of Party Smart Capsules After-effects of alcohol Headache Nausea and vomiting Drowsiness Fatigue and body ache Burning sensation in the stomach Directions for use Please consult your physician to prescribe the dosage that best suits your condition. 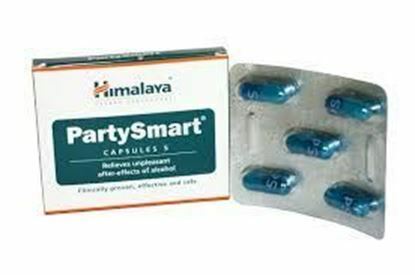 Side effects of Party Smart Capsules PartySmart is not known to have any side effects if taken as per the prescribed dosage. Terms and Conditions We have assumed that you have consulted a physician before purchasing this medicine and are not self medicating. 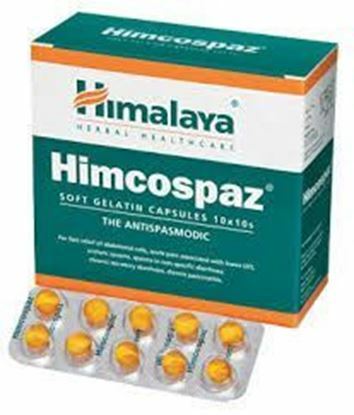 Properties FormCapsule Weight4 (gms) Dimensions3.5 (cm) x 3.5 (cm) x 8 (cm) About Himcospaz Capsule Antispasmodic: Himcospaz inhibits the contractions induced by several spasmogens (agents that produce muscle spasms) like acetylcholine and histamine. Other actions: While relieving non-specific abdominal colic, Himcospaz improves digestion and controls diarrhoea. As an anti-inflammatory and analgesic agent, the drug is effective in alleviating the pain associated with menstrual cramps. Prostaglandin inhibitors found in Himcospaz are effective in the treatment of dysmenorrhea and other smooth muscle colic. Indications: Uterine colic as a result of dysmenorrhea and pelvic inflammatory disease Abdominal colic including intestinal colic (amoebic colitis) Biliary colic as a result of cholecystitis and gallstones Spasms associated with chronic infective and secretory diarrhoea, bacillary and amoebic dysentery, worm infestation, irritable bowel syndrome (IBS) and mucus colitis Acute pain associated with lower urinary tract infections Acute pain associated with pancreatitis Ureteric spasms Key ingredients: Celery (Ajamoda): has spasmolytic (arresting spasms) properties, which are especially beneficial in relieving gastrointestinal tract spasms. Ginger (Sunthi): inhibits both acetylcholine-evoked and electrically-induced smooth muscle contractions. The spasmolytic property is attributed to the active chemical constituent in Ginger, gingerol, which also inhibits the biosynthesis of prostaglandins (lipid compounds that have a role in pain perception). Ginger is also an anti-inflammatory that helps in the management of pain and discomfort associated with inflammatory changes in the gastrointestinal tract. Side effects: Himcospaz is not known to have any side effects. Terms and Conditions We have assumed that you have consulted a physician before purchasing this medicine and are not self medicating.